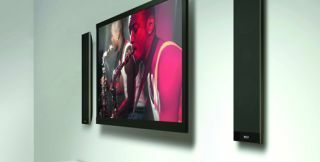 KEF V300 TV speakers launch new V Series | What Hi-Fi? KEF has made official its V300 digital TV sound system, the first model in KEF's new V Series. It's due on sale any day for £700 per pair. The KEF V300 is two 35mm slim speakers, which are designed to sit either side of your TV, and a compact "activation module", which contains all the necessary amplification. Connect this amplifier module via a single HDMI cable to your TV and you're good to go. The V300 speakers come with desk stands or can be wall-mounted or used with optional floor stands. The floor stands are £225/pair. Inside each speaker you'll find two 4.5in bass drivers and a 1in aluminium tweeter, which features KEF's familiar "tangerine" waveguide that aims to aid sound dispersion. The amplifier box contains dual class D digital amplification with switchable on board DSP EQ that allows for adjustment to the bass dependent on your speaker positioning. If you don't fancy adding this module to your kit rack, it can be fixed to the back of a TV via the VESA points (found on most TVs) or attached to a wall using an optional mount. You can use your TV remote control to turn the speakers on and adjust volume, while adding a KEF subwoofer for more bass is also an option. The new KEF V Series was given a soft launch at the Munich High End Show and also includes the V700 soundbar and V720 soundbar and wireless subwoofer.